I do have a couple of finishes to show, the first is from mums first visit up, my take on the scrappy trip along with a Momo jelly roll. It was very much a combined effort - I drew up the pattern, pieced the blocks, joined some of the blocks. Mum took over block joining when my energy gave out. I made the binding, machined it onto the front, and mum took over the hand stitching to the back when it took me 3 goes to get 10" along.... 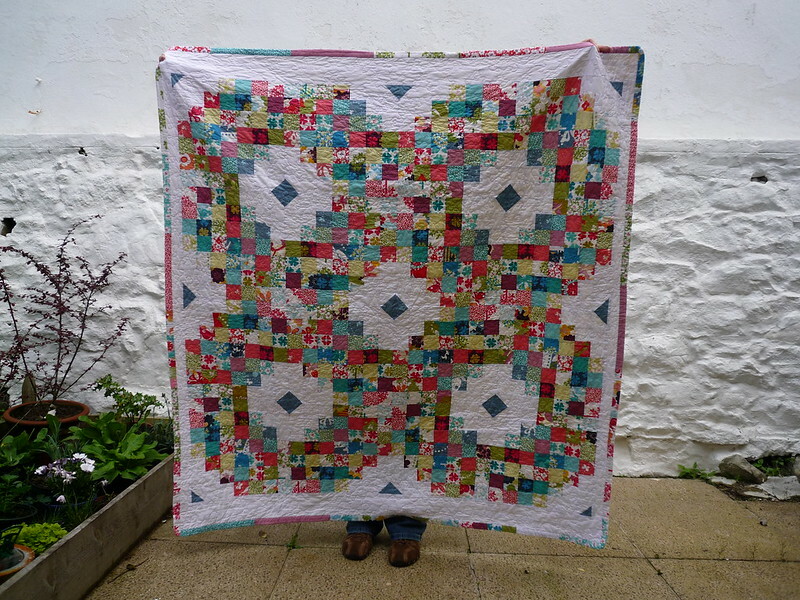 I dont think the photo quite does it justice as it really is a bright and lively quilt. To keep busy whilst I moped about on the sofa / in bed with a bucket, mum took a stack of charms I'd cut to make a siblings together quilt, and she came up with this one. Honestly I think I picked a dodgy combination of fabrics here, we both struggled with it for a while, but when finished I think it looks fine and I hope it will give some wee brother a nice quilty cuddle. The other finish is one that is currently with Jo in Edinburgh for the Modern Quilting Exhibition! I sent this, Staind II and Dorothy. The quilts by others that I know of that will also be there are proper beauties, so I hope mine dont let the show down too much! I like them though, and they're mine, so they fulfill their purpose! Mum was flicking through some of my many, many unmade quilt designs one day and chose this one. Of course I already had the fabric bundle specifically for it sitting waiting, so she was happy to get stuck in! I do that you know. I draw up quilts, I get all the fabrics, I bundle it up, and it just sits there for years in a massive big queue. Seriously, if I had normal energy levels and perfect health, there'd be quilts filling every cupboard in the house. (Instead of just the one. And two rooms of "bundles"). Another combined effort. I did the design. Mum did the piecing and basted it. I did the quilting, and after 3 attempts, I managed to bind it. Nope, no idea what the f*** went wrong with this one but it was my worst effort at binding ever the first time. Still, third time lucky and I did manage to post it just in time! Again, I wish the weather hadn't been so "peasoup" (we've had almost a month of mist or fog up here) so the light could have been better for this one. The colours are just wonderful. 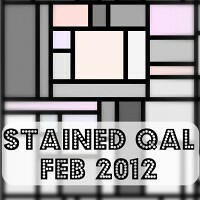 As I was quilting I was constantly dreaming up new quilts with the colour combinations created on each strip here. They really are yummy. LOVE that scrappy trip along variation! I missed your news, huge congratulations! Sorry to hear you're still not feeling too good, pregnancy is no walk in the park. Lovely finishes though! These are really great finishes, you and your Mum are the best team. 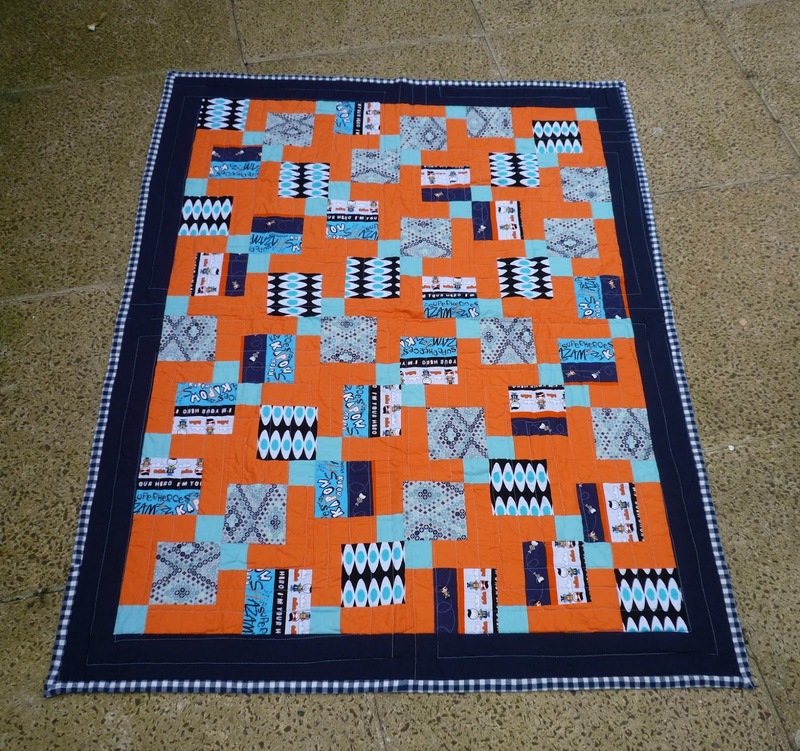 I love your version on the scrappy trip along and the colour combinations on the third quilt look so yummy. The quilts are wonderful, I love them all, especially that last one, well and the first one too. I got to spend time with Emily at the retreat and she is just wonderful so I am glad to hear she is basting and quilting for you. I cannot believe how much you have got done! Love the Scrappy Trip version of yours. Prefer it to total scrappy. And your quilts totally deserve to be in Jo's show!!! LOL! Glad to see you haven't puked away your sense of humour!! Your collaborations are so beautiful! And the colours are brill! Great designs too! Well done Team Sarah! Great job on all 3 quilts! I especially like the first one. You've got so much done at a time of feeling so crap! Well done. I love how your scrappy trip worked out. Hope you perk up soon. When is hubs home again? what great team you and mum make! i love the secondary pattern in the range & blue siblings quit, i think its a vanishing nine patch, corners and center blue and edge middles in orange? I've never noticed the offset + before. 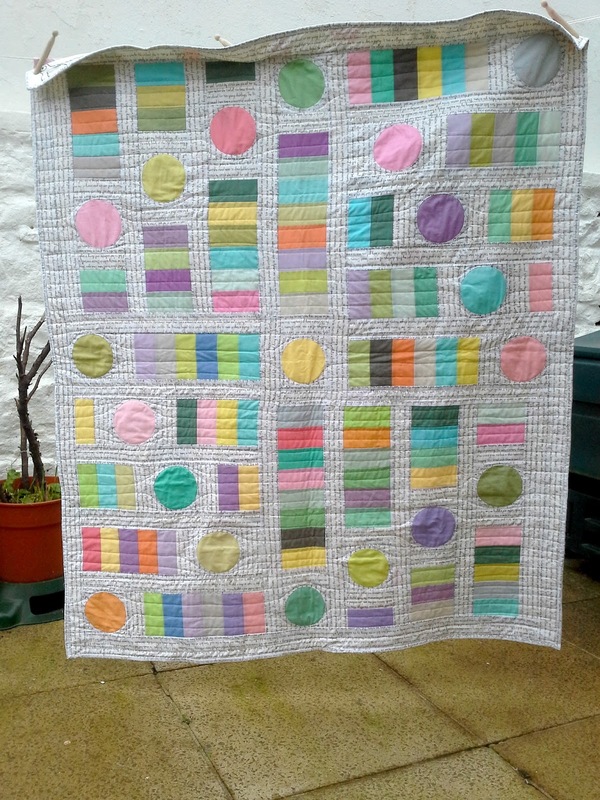 the last quilt top is lovely, are they applied circles? snowball blocks? blinking spell check, *PUKING * not poking! I love the blue & orange quilt! You have achieved loads considering the belly full of arms & legs & the puking. Dear god I remember the puking so well from my pregnancy, not one to ordinarily puke easily I could have puked for a gold medal!! Why don't they give those??? It seems my previous comment disappeared into the ether but my congratulations are no less hearty. Very exciting times for you & loads of new sewing & knitting opportunities. Hears to less of the puking, more of the sewing. Wow lovely quilts....glad you're feeling a bit better. Sorry, late comment again! Quilts amazing as usual...! Will be phoning soon! Boo the continued puking! Hope that stops asap for you and you are not as unlucky as I to have it the whole pregnancy! For someone sick as anything and struggling you are achieving a lot! I know your mum helped but I can only conclude you two make one hell of a team. Great finishes here.....and the scrappy trip is one of the best I've seen. Very well planned out, love how the white and corner blocks make it so different. Narcoleptic, fabric addict, self taught sweary learner sewing lass. I make quilts, some bags, the occasional ragdoll, and a lot of mess. All inbetween, and sometimes during, sleeping. A lot.